Intel’s 4th-generation Haswell platform had been one of the most recurring customer of the rumor mill, we already knew quite a bit about the platform, even before the launch, thanks to the good ‘ol rumor mill. But rumors aside, at this year’s Computex, Intel finally announced it’s Haswell platform. Haswell was one of the highlight’s. With that we bring you yet another announcement from Intel, which pre-announced two new Haswell parts, the U-mobile series to be precise. The parts are scheduled to be available in Q3 2013. Moving on to the specifics, the older of the two is the Core i5 4350U, it’s a dual-core affairs with four threads and a very low TDP of 15W. The chip operates at a base frequency of 1.4GHz, achieving 2.9GHz with the help of Turbo Boost, a considerable jump indeed. The processor also features Intel HD 5000 series graphics, clocked at 200MHz with a turbo boost up to 1100MHz. It comes in FCBGA 1168 40mm x 24mm x 1.5mm package. As with all Haswell parts, the Core i5 4350U is also based off a newer 22nm manufacturing process, also featuring 3MB of cache. As much low power as it may be, the part will sell for a price of $342 once it’s available. Next in line is the Core i5 4200U, also featuring a dual-core and four threads. Compared to it’s older brother, the Core i5 4200U features a faster base clock frequency of 1.6GHz, with turbo boost up to 2.6GHz. The Core i5 4200U packs Intel’s HD 4400 graphics, clocked at 200MHz, with turbo boost up to 1000MHz. It’s slower than it’s bigger brother Core i5 4350U. It will feature a price tag of $287. The Haswell U-series parts will be quite popular amongst Ultrabooks, also note that Intel also plans to launch three more Core i7 U-series parts, which will be considerably faster than it’s Core i5 brethren. 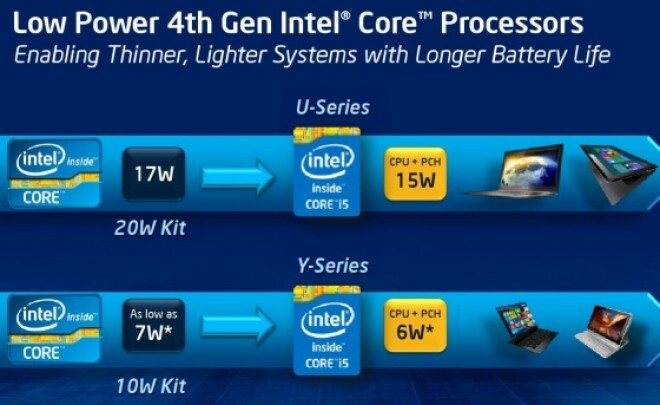 Although with added performance, the price tag will also increase for the 15W Ultrabooks.